Our Physical Therapist Grand Rapids office specializes in treating injuries, pain, and disabilities with the goals of restoring, maintaining and promoting function. We begin with a thorough evaluation by a licensed physical therapist to determine functional limitations within the musculoskeletal system. A plan of care is created with goals made by the physical therapist and patient in order for the patient to return to their personal level of optimal function. 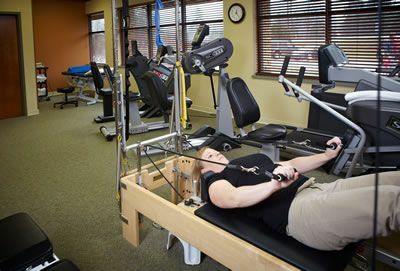 Our Grand Rapids Physical Therapy facility utilizes extensive exercise equipment, aquatic therapy, as well as developing at home plans to achieve desired results. Our Grand Rapids physical therapy location offers a full range of physical therapy services, including aquatic therapy. We also offer a Grandville location to better serve our customers.